Pride is a time for celebration for the LGBT community. From May through to September, the country celebrates from many small festivals to large major parades in our cities. In 2014, I attended Pride in London and took the picture below from LGBT network Freehold with an arrow pointing saying “engineer”. I stood in the crowd seeing some engineering firms walk past, but nothing as compared to the number of banks, or the Armed Forces. I set a challenge to myself that I would see Engineering companies in a future Pride in London parade. Challenge accepted. In 2014, I had attended the Royal Academy of Engineering (RAEng) event “Data Driven Diversity: Facts about being LGBT in Engineering”, attended my first InterEnergy event, was getting involved with diversity with IChemE, and read “The Glass Closet” by Lord Browne. It became clear to me that Engineering needed an inter-network to bring together LGBT engineers and supporters. Strength in numbers is necessary to champion change to move the needle on LGBT inclusion in our industry. Trouble was, I did not even know if there were many LGBT engineers! Tom Wallace and I discovered each of us were pushing for similar aims: I had established the @LGBTEngineers Twitter account, and he had set up the “What’s It Like” initiative to profile LGBT engineers. We agreed we would be a stronger force working under one umbrella and not so long later met Jason Linford and Peter Gracey. We spent the summer forming our Terms of Reference and met with Stonewall for guidance. Fortunately for us, Tom has great webpage development skills and put together a fantastic webpage for us. Eventually, we were ready for our launch on 8th December 2014: “Starting Out”. Would anyone turn up?? The night was a great success, we had over 40 people attend and this formed the start of our membership and mailing list. There was a great buzz and excitement in the room for what we were hoping to achieve. We used the opportunity to ask people what they wanted from the network, and used this to inform our initial strategy for InterEngineering. Now we have over 500 members, three regional groups (London, South West & Midlands), and strengthening relationships with engineering institutes, companies and even the UK Government. Other blog posts give a flavour for what we have achieved in the time since. However, Pride in London 2016 was a real reflection point for me. We got the funding from our sponsors Balfour Beatty, Amec Foster Wheeler, and SPIE UK. BB have a growing LGBT network, and our connection to the business Christina Riley is making real change for LGBT in the Construction sector. The team from AmecFW have engaged InterEng from the very beginning and we have been with them on their journey from their initial idea to set-up an internal LGBT employee resource group. Now, they are a fledgling network in the organisation which is growing and which externally market on social media to illustrate a commitment to LGBT inclusion. These are the early steps to get in motion the cultural change in an organisation, and embodies the essence for which we established InterEngineering. SPIE UK are in the early stages of creating an LGBT network, and have a management team which support this. They had a great staff turnout with us at the Pride in London parade and we look forward to working with them further. 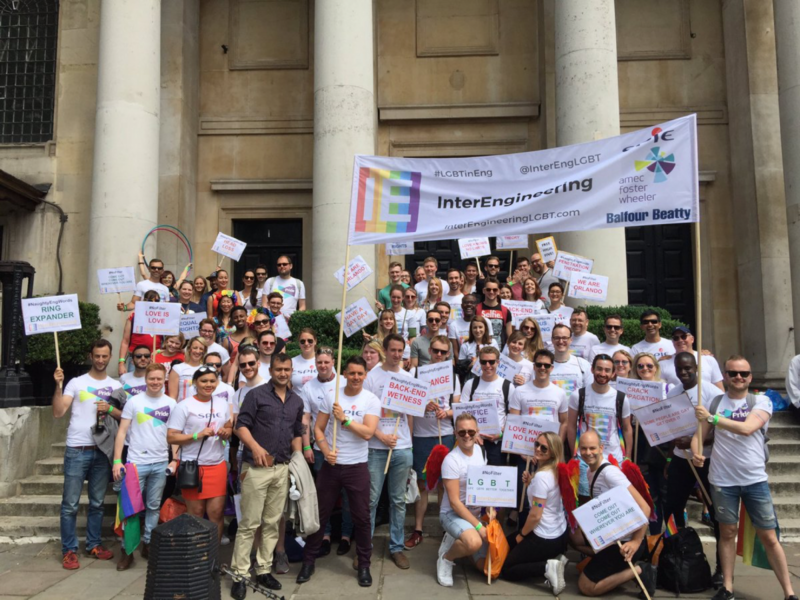 We had just over 100 attendees march in the parade with us including LGBT engineers and supporters of InterEngineering. In the tongue-in-cheek spirit of Pride, we made #NaughtEngWords placards to capture the attention of the crowd, educating them on some risqué but genuine engineering terms! Only two weeks prior to Pride, 49 people were massacred in at the LGBT nightclub, Pulse in Orlando, USA. This was an attack on the LGBT community, and reinforced the meaning for Pride. To show our solidarity, we also included positive messages on our placards including #LoveWins and #WeAreOrlando. I will never forget the experience walking round Regent Street, and onto Piccadilly leading InterEngineering holding my husband’s hand, raising the #WeAreOrlando placard, and the crowd cheering and clapping. Christina took the picture below and it illustrates the feeling and emotion of the day. So, two years on from standing on the side lines, I delivered on the challenge I set myself. Pride does mean Pride, and I had it bursting from my heart walking through London. It means coming together through unity and love, and to get through adversity. There are many places where being LGBT+ is dangerous, and where oppression permeates the lives of those who cannot be out. Some accept that they are tolerated, so long as they conform. This is not a good place to be for your mental health. In the workplace, I believe companies have a duty to create an open and welcoming atmosphere where everyone can be themselves without fear of bullying, discrimination or stalled career advancement due to reaching a glass ceiling. Here, inclusion and intersection are the key. Working together with other minority groups showcasing role models and reverse mentoring senior leaders. This helps change hearts and minds of those in an organisation, and consequently makes them better citizens of the world who themselves may challenge adversity in other communities they are members of. We will continue to make the case for change in our industry to make sure there is a clear path for people to be themselves at work. I would like to take this opportunity to thank everyone for their continued help and support so far with InterEngineering. We have achieved a lot in a short space of time, and look forward to growing the network so we can connect, inform and empower LGBT engineers and supporters across the UK and beyond. Onwards to Pride 2017!